-That I have a serious addiction to sparkly objects. 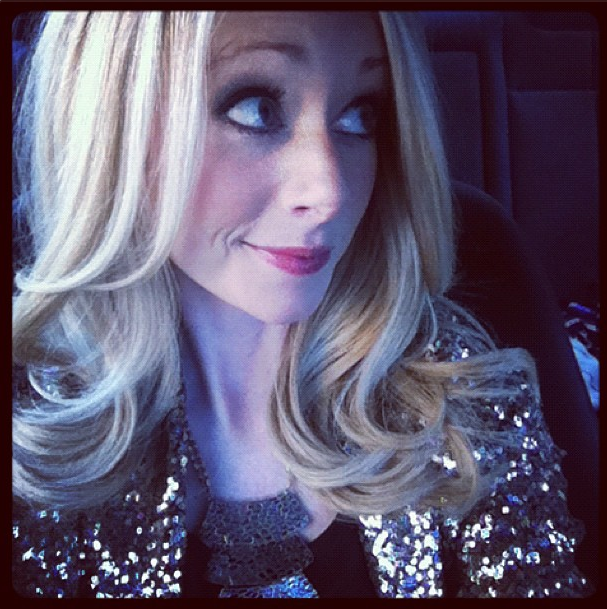 I am over the moon for this sparkly little jacket from Savoir-Faire. I had some outfit photos with Keely Yount, a talented local photog yesterday, so this was the perfect ensemble for the chilly weather and the sunset lighting. -That I have an obsession with faux leather. I recently purchased this little leather number (seen below on the lovely Jena) from Maude and love it so much my heart hurts. It may be the best leather (or pleather) item I’ve bought to date. -That I am a nerd. Stephen and I have started re-watching all seasons of The Office again. We’ve both been loyal fans forever, so since this is it’s last season, we thought it’d be fun to start from the beginning again. I will miss this show dearly when it goes off air. -That we only put up one Christmas tree this year. Last year, I put up two trees, tons of decorations, etc. This time, I just wanted to be able to enjoy the season for what it is rather than spending every waking moment decorating. I chose wisely. This has been a fabulous holiday season thus far. What have you been hankering to say this week? Vent, girls! You are too cute! That jacket is adorable and I looove that skirt!! Also, I haven't put up any decorations yet! I'm still debating: I feel like the decorations I hVe now wouldn't be worth it in the larger space I have now. You slacker! Only 1 tree??? Says the girl who hasn't sent out Christmas cards in years. I will miss the office too! It's getting weirder and weirder with each episode lately but I love it. Have a great weekend.